The demand for increasing awareness of the Food Safety Modernization Act (FSMA) has never been greater, and with this demand comes an increasing requirement for training to facilitate a proper food safety management system. To meet these demands, the industry needs to see dramatic improvements in the quality and quantity of food safety trainings. While the cost of training is high, it is negligible compared to overall costs of a product recall or possible food safety-related health issue raised from consuming an unsafe food product. There are several challenges ahead for proper food safety training at all levels and job descriptions; these challenges include, but are not limited to, numbers of training hours, type, content, and facilitation procedures. Applications of customized base training, mass custom training, and tools such as e-leaning could have dramatic impacts on food safety management systems, improvements in FSMA compliance, and employee productivity. There are several tools to improve an effective food safety program. 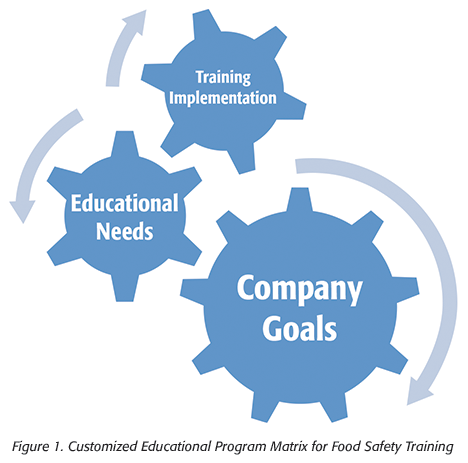 The most productive food safety training program requires a matrix-based educational system addressing FSMA priorities. Examples of food safety educational improvement objectives could be awareness about food temperature, safer handling of utensils and products, proper cleaning/sanitizing, and general food safety principles. The training content could be designed based on two main learning categories: constructive and authentic. The constructive content learning method assumes students have a prior education related to the topic (in this case, food safety) and will construct additional learning based on previous information. This approach enables the connection of new information to prior knowledge using variety of educational tools. The authentic content learning method assumes that student do not have prior education related to food safety and will learn the content for the first time. Both Constructive and Authentic: All learning is received through the instructor with little room for interpretation as most tasks involve memorization. Constructive: Educational and technology learning tools (such as graphic organizers) are used to build on prior knowledge and construct meaning. Authentic: Technology tools are incorporated to develop some content specific activity. Constructive: Educational and technology tools are used independently to learn and build related knowledge. Authentic: Educational tools and technology are used to develop activities that are beyond the instructional setting. Constructive: Technology tools are used in a way that makes for an improved version of understanding. Authentic: Technology tools are used to achieve goals beyond instructional setting. Both Constructive and Authentic: Educational tools and technology allow exploration and extension in projects that may have been impossible without. Course Description: This professional development course gives an overview of basics of personal hygiene and its effects on food safety, which helps familiarize students with general personal hygiene practices as a food safety management system requirement. This characteristic is concerned with the flexible use of technology to build knowledge in the modality that is most effective for each student. Course Goals: This class aims to teach the basic principles of personal hygiene, so that students will be able to utilize best personal hygiene practices to build on prior knowledge and construct meaning. Target Audience: This course is designed for staff involved in receiving, processing, storage, and shipping, retailers and suppliers, dairy plant managers, corporate office staff, as well as those who require retraining, as defined by the customer. This course will include 2 hours of a better food hygiene practice and methods of transmitting pathogenic microorganisms plus 1 hour of proper documentation and weekly incentives for a better personal hygiene. Course Description: This professional development course gives an overview of basics of personal hygiene and its effects on final product food safety, and familiarizes students with general personal hygiene practice as a food safety management system requirement. This characteristic is concerned with the flexible use of technology to build knowledge in the modality that is most effective for each student. Course Goals: This class aims to teach the basic principles of personal hygiene, so that students will be able to utilize best personal hygiene practices, placing learning into a meaningful personal hygiene context while increasing personal hygiene relevance to the learner, tapping into students’ intrinsic motivation. Target Audience: This course is designed for staff involved in receiving, processing, storage, and shipping, retailers and suppliers, dairy plant managers, and corporate office staff who are new hires or require instruction pending employment. In conclusion, developing a written educational strategy that identifies the target audience(s), skills, and knowledge, and conducting an effective implementation program is critical for building an effective food safety management system for FSMA compliance. Given several examples of failures in food safety programs resulting in foodborne outbreaks, it is clear that prevention, through a productive and comprehensive food safety education and written program, is essential. The overall cost of these types of advanced educational programs is minimal when one considers the benefits to product quality and safety, and the significant expense of product destruction, lost utility, and market withdrawal. Critical to implementation of an effective employee training program is the incorporation of cutting edge technology, subject matter experts developing the training material, use of modern video technology, and a positively reinforced testing/training accountability program. Creating dynamic and informative training is difficult, particularly when considering multiple levels of prior knowledge, experiences, and variations in job descriptions. Use of an outside expert who is well-versed in review and improvements to food safety training programs will enable more confidence in the food safety management system’s effectiveness and resulting FSMA compliance. Mehrdad Tajkarimi, D.V.M., M.P.V.M., Ph.D., is an expert in national and international food safety regulations, warehouse and wholesale manufacturing, and the dairy, grain, poultry, and retail industries. He assists clients with organic requirements, FSMA, and natural food preservatives and packaging, foodborne pathogenic and spoilage microorganism characteristics, and shelf-life studies. He is an independent consultant to the EAS Consulting Group.